So it started with Self-Service BI Tools: Round Up and Deep Dive Webcast Recap which I posted on the way to Nashville. Many of the products mentioned in the blog were topics at the BI+Analytics conference. Veselina Peykova writes about workarounds in Accessing sap.com with different users (at the same time). She has received 17 likes already so this is a popular blog on a popular (but frustrating) topic. Jitendra Kansal, SAP Mentor a new SAP employee, Learn about and get hands dirty on latest & greatest of SAP Mobile offerings @SAPTechEd 2017 -don’t you wish you could clone yourself and attend all sessions at all three SAP TechEd’s? I invite everyone to the Fall Forward and Join the #ASUG Virginia Chapter Fall Meeting in October in historic Richmond, Virginia. With a mix of partner and customer stories, and great hosts (Altria), the event is not to be missed. See you there? Did I say Altria serves the best ASUG Chapter food I’ve ever had? They do. Think about whether you want to dedicate your free time to the community, whether you have that passion for what you do, whether you enjoy learning constantly, and whether you have availability, because being a Mentor is not just partying, going to events and earning a cool shirt. Jocelyn Dart writes Fiori elements – Status Icons and Semantic Colors and offers sessions for SAP TechEd. Jocelyn continues focusing on accessibility, and important topic. She also writes Fiori elements – Percentage Progress Indicators. Jocelyn’s blogs are in-depth, sharing her knowledge, and not to be missed. I recapped the BI+Analytics Conference in BI+Analytics Conference – It’s a Wrap #BIAConf – what stays with me are the people connections and Jessica Buchanan’s keynote. Someone counted 10 SAP Mentors in attendance too, with Clint Vosloo traveling 53 hours to get there. I failed to get pictures of dust bins, something Jelena or Jim Spath might do. 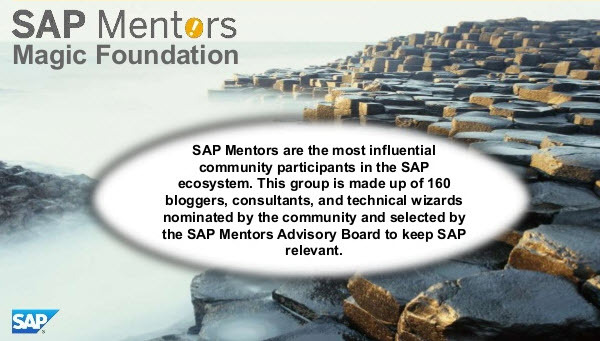 SAP Mentor Program Lead Jason Cao writes More Voices from the Community at SAP TechEd Barcelona 2017 – I’m looking forward to Moya Watson’s upcoming blog about SAP Community Sessions at Las Vegas. What other moments did I miss?